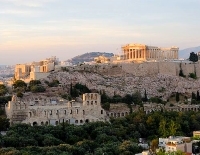 In Athens, first-time visitors generally flock to the Acropolis. Perched on a steep, flat-topped rock above the sprawling city, the citadel is a striking image of the ancient world. Essentially, it is a timeless collection of magnificent temples, most of which honour Athena, the goddess of wisdom. The Athenian statesman, Pericles, erected most of the present-day ruins after Persians destroyed the original buildings. Visitors enter through the Propylaea: the monumental entranceway. The tiny, restored temple of Athena Nike is to the entrance's right. All things considered, the Parthenon may be the Acropolis' biggest drawcard. Built of Pentelic marble quarried from the distant mountains, it's the greatest surviving monument of Doric architecture, and the backdrop to a magnificent view of Athens. The Erechtheion temple sits alongside the Parthenon. According to mythology, it is the site where Poseidon and Athena contested the right to be Athens' deity. Athena won after gifting Athens the olive tree. Lastly, the Acropolis' museum is located by the citadel's southern slope. It displays some of the carvings and friezes recovered from the temples. Admission: €20 for adults, under 18s free. Other concessions available.